For combined beauty and interest—varied beauty and historical interest—there is no place “within easy reach of London”, certainly no place within the suburban radius, that can compare with the stately Tudor palace which stands on the left bank of the Thames, little more than a dozen miles from the metropolis and, though hidden in trees, within eye-reach of Richmond. It is not only one of the “show places”, which every traveller from afar is supposed to visit as something of a duty, but it is a place that conveys impressions of beauty and restfulness in a way that few others can. It remains ancient without having lapsed into a state of desuetude that leaves everything to the imagination; it is a living whole far from any of the garishness that belongs to contemporaneity. Whether seen from the outside on the west, where the warm red brick, the varied roofs, the clustered decorative chimneys suggestive of the Tudor time make a rich and harmonious whole; or from the south east, where the many-windowed long straight lines of the Orange additions show the red brick diversified with white stone, it is a noble and impressive pile. Within, too, are priceless treasures, themselves alone the objective of countless pilgrimages. And recognizing the attractions of the buildings and their contents is to take no account of the lovely grounds, and of the crowding associations of a place that, since its establishment four hundred years ago, has again and again been the centre at which history was made. Throughout our records for many centuries the valley of the Thames has been favoured when our monarchs have sought to establish a new home. Greenwich and London—the Tower, Whitehall, Buckingham Palace—Richmond and Hampton Court, Windsor, Reading and Oxford, are some of the places that have at one time or another been the chosen centre of royal life; and Hampton Court Palace is the newest of those situated close on the river’s bank, though nearly two hundred years have elapsed since it was a regular royal residence. It was, indeed, for something less than the same length of time that it was in use as a home of the sovereign, but within that period it saw two revolutions, and the change of national conditions from the comparative mediævalism of the days of the eighth Henry to the comparative modernity of the beginning of the Hanoverian era. It is not, perhaps, overfanciful to see something of the lavish richness, the opulent homeliness, of the earlier period typified in the varied buildings, courts, and gateways of the Tudor portion of the Palace, and the more formal grandeur of the later time in the symmetrical stateliness of the later part. Hampton Court Palace was the centre of many of the bluff King Henry’s hunting parties—and the scene of some of his marital excitements, and here, too, his long-hoped-for son was born; it was the scene of Elizabethan pageantry, and of the attempt on the part of the Virgin Queen’s successor to force other men’s religion into his own particular groove; at Hampton Court Charles the First was seen at his best in the domestic circle and—after the interregnum—where his son was seen at his worst in anti-domestic intrigues. Here Cromwell sought rest from cares greater than those of a king, and here he was stricken with mortal illness; here William and Mary dwelt, and here the former met with the seemingly trivial accident which cost him his life. 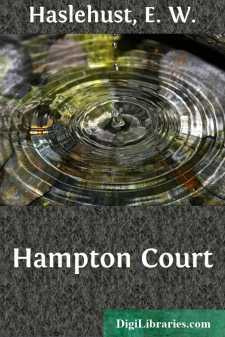 That the “story” of Hampton Court is, indeed, a full, splendid, and varied one is shown in the three fine volumes in which it is set forth by Mr. Ernest Law, a work to which no writer on the history of the Palace can help feeling indebted. Those who would learn the intimacies and details of the history of the place have Mr. Law’s history, and those who seek a “guide” are well provided for in the official publications. Here, I am concerned with the history of the place only in its broader and more salient points, and with the minor details necessary in a guidebook not at all; I seek rather to give something of an impression of the past and present of the Palace, something that shall at once indicate the associations of the place, indicate its story, and hint at what there is to see, and that shall serve as souvenir and remembrancer of that which has been seen.